What are alkalizing and acid producing foods? In today's article, I share how consuming or eliminating certain foods help balance your pH level, and how alkalizing your body can improve your health. When you hear the phrase “pH level,” I’m guessing you have flashbacks to high school chemistry class. While your knowledge of the subject may be limited to those acid rain experiments (remember how the paper changed color when it was exposed to either acids or bases? ), learning why pH is important when it comes to your health is a topic worth exploring. You may have heard about the alkaline/acid relationship as it relates to diet, but what does it all mean? Can eating or eliminating certain foods help balance your pH level? And why is that even important? Simply put, some foods are acidifying when introduced to the body, and others are alkalizing. So what you consume on a daily basis will change the pH levels of your blood, saliva and urine. The pH scale goes from 0-14 (with acidic substances falling below 7 and basic substances falling above 7). Normal levels for body fluid pH hover right in the middle of that range. Foods can either raise or lower your pH level, and this is based on the mineral content of the food – not the actual pH of the food itself. 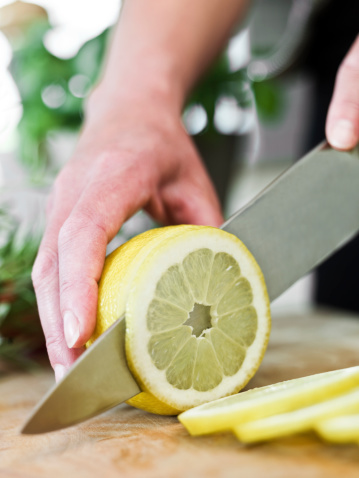 Lemon juice, for example, has a low pH, but has an alkalizing effect on the body when consumed. Still with me? Good. Now, let’s talk about why your pH level matters. A growing body of research suggests that having lower, or acidic, pH levels is associated with greater risk for conditions like type 2 diabetes, heart disease and obesity. Higher, or alkaline, pH levels, accordingly are linked to improvements in memory and cognition, reduced pain and lower risk of hypertension and stroke. Another area that has been researched quite extensively is how pH levels affect bone health. Many studies have shown that low-acid diets can help improve bone density. One particular study published in The Journal of Nutrition also found that alkaline mineral waters can decrease bone resorption and even lower parathyroid hormone levels, which regulate the release of calcium from bone. An alkaline diet, one that incorporates foods that can increase your pH levels, is also associated with an increase in growth hormone, which I call “The Fountain of Youth” hormone – it helps you shed excess fat, improve your libido and retain a general sense of well-being. Who doesn’t want that? If you’re already someone who eats fairly clean, I have good news for you – you probably have a higher than average pH level. Yet you may be surprised to find that some of your favorite foods are actually acid-producing, and the ones you think are acidic really aren’t. Additionally, your pH will vary depending on the time of day, what you ate or drank the day before and even your stress levels. If you want to boost your alkalinity, however, there are easy dietary adjustments you can make. Popular sugar alternatives like honey, xylitol and beet sugar are all acidic, but stevia is alkaline. Who knew? Your wine and cheese habit isn’t doing your pH any favors, so minimize these foods. And if you can swing it, give up your daily cup of joe, too. If you want more information about which foods are alkaline and which are acidic, check out this handy resource guide.